UChicago's four-year, co-curricular offerings help students develop skills, commemorate milestones, and make lifelong memories. 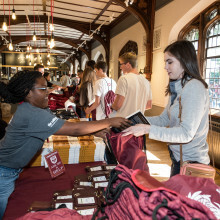 Unique opportunities for incoming students to explore the UChicago way of life before the start of the academic year. 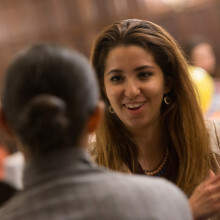 Local gatherings for the incoming class hosted by UChicago families and alumni. The College's official welcome celebration and introduction to UChicago's campus, traditions, and community of scholars. A program that connects incoming students with upper-class mentors to aid in their transition to the College. An annual celebration of the important impact parents and families have on the lives of UChicago students and our campus community. An event exclusively for second-year students focused on supporting ongoing academic success. A conference-style event providing career exploration for first-year students through alumni networking. Celebrations held for each class year at fun and exciting venues across Chicago. A series of events celebrating the culmination of the College experience for seniors. UChicago recognizes the contributions of undergraduate students by offering a variety of leadership opportunities, and the awarding of academic honors. College Programming and Orientation (CPO) works to connect students and families to the College through transition-focused programs and events, while also seeking to build stronger community on campus. The CPO celebrates significant milestones that reinforce lifelong institutional affinity and engagement with the University.